Or if you just have a question, Email us in the contact section. We will get back with you within 24 hours. Since 1983, Vitek Chiropractic has been working with patients to provide the best chiropractic care for patients in Katy, Texas. 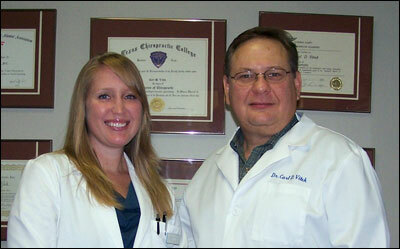 If you are looking for a chiropractor in Katy, we welcome you to Vitek Chiropractic. We accept patients of all ages and incorporate a variety of techniques to insure the best possible results. When you have needs for chiropractic care, you need to turn to a chiropractor who listens and responds…an experienced doctor of chiropractic who knows the field and can effectively diagnose and treat your needs… a friendly chiropractor who counsels you on the best ways to maintain and improve your health. Our doctor[s] of chiropractic meets all these criteria. Plus, you benefit from a dedicated team of trained professionals who give you the individualized attention you deserve. Vitek Chiropractic believes that informed patients are better prepared to make decisions regarding their health and well being. That is why we’ve included information on this website covering an array of topics associated with chiropractic care. At Vitek Chiropractic, we strive to make our office as efficient and convenient as possible. Included in these web pages is information about our office, including maps, directions, hours, insurance policies and appointment scheduling. Our practice specializes in treating a variety of conditions, from chronic low back and neck pain to rehabilitation following an accident or injury. We can also provide information about improving your diet, creating a healthier workplace, and increasing the overall quality of your health. Services we provide (depending on your needs) include DECOMPRESSION THERAPY(traction) and ACUPUNCTURE. In addition we provide exercise instruction (rehab), a wide array of modalities such as ultrasound, electrical muscle stimulation (EMS, TENS, interferential, Russian, biphasic, and premodulated currents), vibratory massage, and intersegmental traction. Our goal is to help as many people as we can. We will do anything within our scope of practice to ensure the best possible results. It is also our goal to have a high percentage of excellent results, therefore we only accept those patients we truly believe we can help. If we feel your condition is not chiropractic and that we can not help you, we will try to find someone who can.